What happens when a town loses its newspaper? Staff writer Nicole McNeill traces the rise and fall of the Chapel Hill News, which served the community surrounding The University of North Carolina at Chapel Hill for nearly 100 years. The paper and its legendary editor, immortalized in the “Shoe” cartoon above, won numerous awards as the paper diligently covered the impact of the civil rights movement on the college town. In its absence, several community groups and publications have attempted to fill the void. Most recently, the student-run Daily Tar Heel has launched an electronic newsletter for residents. Chapel Hill is a vibrant community of 60,000 residents. It has a highly regarded public school system and is home to the flagship campus of the University of North Carolina. It draws performers, artists and thinkers from all over the world. But as of January 2019, the town had no local newspaper. Like hundreds of newspapers across the country, the 95-year-old prize-winning paper, The Chapel Hill News, slowly faded into irrelevance long before it was officially closed. At the height of the paper’s editorial prominence in the 1970s, when it was called The Chapel Hill Newspaper, it published, on average, of 22 pages of highly focused local news coverage published six days per week. "The Chapel Hill News was a real local newspaper," said Thomas Ricketts, a 50-year resident of Chapel Hill and former reader of The News. He said that it covered parties and town events, but also looked over the shoulder of the university, had an eye on the administration of city services and kept Town Council members on their toes. By the late 2000s, however, the coverage was so limited that Ricketts had stopped reading it. In an attempt to fill this void, the Daily Tar Heel in February 2019 launched a new initiative. Called the OC Report, it is a community newsletter that links back to a section and landing page on the Daily Tar Heel site. If there’s market demand, the paper plans to expand the newsletter to a two-page per week town news section inside the Daily Tar Heel print edition. 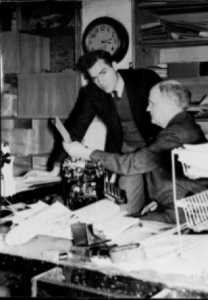 Chapel Hill Weekly founder Louis Graves (seated) and writer Joe Jones in the newspaper’s office, 1951. Courtesy of the Louis and Mildred Graves Papers, North Carolina Collection, Wilson Library, University of North Carolina-Chapel Hill. This newsletter harkens back to the Chapel Hill News’ local focus, a core value of The Chapel Hill News’ original owners and a way to build reader loyalty. It was founded as the Chapel Hill Weekly in 1923 by Louis Graves, UNC’s first journalism professor. Chapel Hill business owner Orville Campbell, a UNC alumnus and former editor of The Daily Tar Heel, bought the Weekly in 1954 and held it until his death in 1989. The paper flourished under Campbell, who changed its name to The Chapel Hill Newspaper in 1972, when its publication was increased to six days per week. At the beginning of the 1990s, the paper was briefly owned by Ottaway Newspapers, a subsidiary of Dow Jones (then owner of The Wall Street Journal), but was sold again in 1993 to the nearby News & Observer of Raleigh. In 1995, McClatchy purchased The News & Observer. Over the next two decades, The Chapel Hill News started carrying less local and more regional and national news from the McClatchy network of newspapers, while many of the paper’s other functions, including ad sales and print production, were moved out of town. During this time, McClatchy also took on billions in debt to fund newspaper acquisitions, including the purchase of the Knight Ridder chain in 2006. By 2017, McClatchy had added to its holdings in the North Carolina capital region (called the “Triangle”) nine suburban weeklies in addition to The Chapel Hill News, plus the daily Herald-Sun of Durham. However, The News & Observer was often treated as the primary newspaper for Chapel Hill. For example, after the 2008 election, The Chapel Hill News carried a single local story – describing residents’ reactions to the election of President Barack Obama. Readers were then directed to The News & Observer for additional election coverage. The Great Recession hollowed out newspaper ad sales and forced debt-laden McClatchy to take drastic action to right its balance sheet. The company used the close proximity of its Triangle newspapers to cut dozens of newsroom jobs. Though The News still claimed to have a local focus, by mid-2017 the two remaining News reporters and single editor were reassigned to Durham’s Herald-Sun – purchased by McClatchy in December 2016 – and the paper was both written and produced outside Chapel Hill. In January 2018, the paper was officially closed and replaced with an advertising supplement, focused on dining and entertainment options. The loss of The Chapel Hill News is all the more tragic because, by all accounts, the paper did everything right. Its prominent owner and publisher, Orville Campbell, and its legendary editor, James Shumaker, won awards for nearly every aspect of the paper in the 1960s and 1970s. 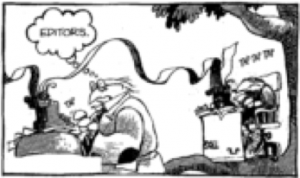 Three-time Pulitzer Prize-winning cartoonist Jeff MacNelly started his professional career at the then-named Chapel Hill Weekly while he was still a student at UNC. He modeled the editor in his comic strip “Shoe” on the gruff, cigar-smoking Shumaker. The Shoe cartoon grew to become one of the most popular American comic strips ever, with millions of readers and syndication in nearly 1,000 newspapers across the country. The newspaper engaged in a daily struggle with itself over its values, its role and identity, and how best to hold a space for the vital, painful transformation from segregation to integration. Some protests were covered extensively, with large front-page placement and accompanying photos. Other events, such as retaliation attacks committed by white supremacists, were minimized or omitted. Former Chapel Hill Mayor Howard N. Lee said that the attitudes reflected in the paper “flip-flopped,” but that they evolved along with those in the town in general. Lee served three terms between 1969 and 1975. He was one of the first African-American mayors of any U.S. city and the first to govern a predominantly white Southern city. During Lee’s first mayoral campaign in 1969, the paper largely ignored him, he said, though he was a heavy advertiser. However, by his second re-election campaign in 1973, Lee had won over Campbell and the paper with his innovative social programs, including Chapel Hill’s free public bus system. As a result, the news coverage of both his performance as mayor and his re-election campaign was largely positive. “The Chapel Hill News made more attempts at recognizing and reconciling its own flaws than other Southern papers at the time,” said Geer. A paper is healthiest, financially, when the column inches devoted to ads outnumber those devoted to editorial content. Up until the early 2000s, the paper published at least a full page of ads for each page of editorial content. However, by 2004, the paper consistently published fewer ad than editorial pages -- an average of 18 pages of ads to 22 editorial pages, though the Sunday paper did include a 28-page real estate section composed mostly of ads and sponsored content. McClatchy reduced the number of pages in the then-semiweekly Chapel Hill News so that ads would still make up about half the paper’s 8-12 pages. When this failed to resolve the paper’s ad revenue imbalance, McClatchy closed it, along with the nine other suburban weeklies, and in their place launched Triangle Today, a four-page dining and entertainment publication that is fully composed of ads and content sponsored by local businesses. As financial prospects for the Chapel Hill paper diminished, so did the news. In the early 1960s, the Chapel Hill News, published as a broadsheet, had an average of 11 news stories on the front page, most addressing residents’ critical information needs. By 2008, the paper had been redesigned as a tabloid. Its front page carried just three to four stories, only one of which addressed a critical information need. Inside the paper, regional, state and national articles and feature stories had displaced most local news. The Chapel Hill News survived longer than it would have as part of a chain because it shared resources within the McClatchy network of newspapers in the area, said Sara Glines, the president and publisher of The News & Observer since 2016. Until they were closed, she also served as publisher of The News & Observer's 10 suburban weeklies. For the last two years of its life, Glines said, The Chapel Hill News was on a financially unsustainable trajectory. During Shumaker’s editorial stewardship, The Chapel Hill News was a mirror of the town. At the height of its prominence, “about 85 percent of people could discuss with you exactly what was going on in town because of The Chapel Hill News,” said 50-year resident Stacy Wynn. Additionally, Haac said, “People saw themselves in the paper. They saw their lives in the paper.” The News not only held local leaders accountable and brought residents’ attention to important issues, but it also highlighted area restaurants and art exhibits, promoted books written by local authors and celebrated town entrepreneurs. “It captured what it was like to live here,” she said. Many residents have a ready list when asked what had been lost when The Chapel Hill News closed. Top of the list is “breaking news,” especially about the town’s elected and appointed leaders. Without a local newspaper, “we’re going to have an uninformed electorate,” said 50-year resident Debbie Finn. “That’s a very serious problem.” Objective voter information is hard to find, and information about town agencies and services is now distributed at the prerogative of town officials, she said. Though The News & Observer and The Herald-Sun cover big issues that affect Chapel Hill, the town isn’t their focus, which means residents “don’t know what they don’t know,” Ricketts said. The absence of The News has also impaired the civic health of the town. “Newspapers don’t solve problems, but they make problems solvable,” said Donald Shaw, an emeritus professor of the School of Media and Journalism at UNC. For example, The Chapel Hill News published years of targeted news coverage and editorials about drought conditions, which pressured town leaders to make policy reforms and revamp the water supply system.